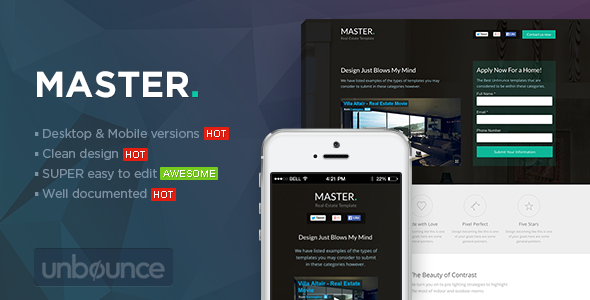 “MASTER” is an Real Estate Landing page template for unbounce, include a lots of features, clean & modern design, you can make an awesome landing page minutes with a Form. This entry was posted in marketing, unbounce-landing-pages and tagged flat, homes, houses, landing page, maps, marketing, mobile, one page, parallax, real estate, unbounce by Acty. Bookmark the permalink.